Corniglia is located in the middle of the Cinque Terre and lays on a small cape, 100 meters above the sea. It is the only town without access from the sea. The tiny village is connected to its train station by a footpath known as Lardarina (377 stairs). Corniglia is connected to the other villages of the Cinque Terre by well kept footpaths, maintained by the park staff. 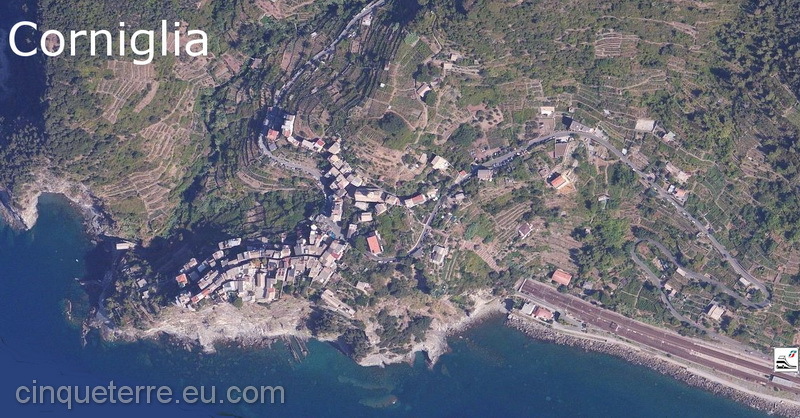 Corniglia is an ancient Roman village that has a long and rich agricultural tradition. The village is surrounded on three sides by vineyards and terraces. Its architecture is closer to that of a rural inland village than that of a coastal village. In this marvellous village tourists may visit the eighteenth century square largo Taragio with its Oratory Santa Caterina. A charming theatrical scene is set here between the houses and the Parish of San Pietro, which is a perfect example of the gothic Ligurian style and is one of the most interesting monuments of the entire coast. This building was built in 1334. In the interior, the most interesting piece of work is the baptismal basin from the XII century, the statues of the evangelists and the polyptych that is divided into segments that represent the Masters. June 29: The San Pietro and Paolo Feast offering the traditional cake "Torta dei Fieschi". September 8: The N.S. delle Grazie Feast at the Santuario di S. Bernardino.